Say hello to Romina. This gal is going to be on my arm all summer long! With an on-trend shape and classic details, the wicker bag has never looked better. If you follow me on SnapChat, you heard me raving about this J.McLaughlin bag a week or so ago! 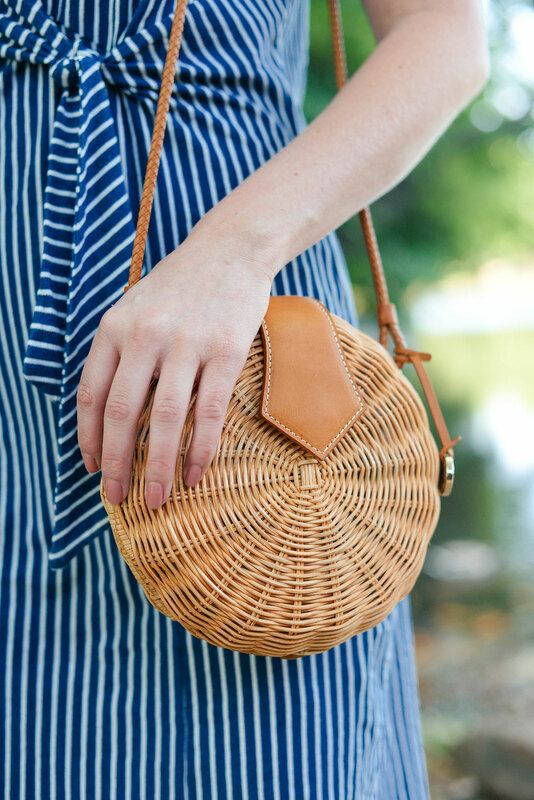 In case you hadn’t heard, this season I am obsessed with round bags, and with summer right around the corner, this wicker style is the perfect choice if you’re looking to try the trend! I love how the silhouette and size makes it wearable day or night, and the rich cognac leather accents make it a versatile option to wear with brights, neutrals and everything in between. If you’re wanting to snag a round bag for the season but don’t want to spend a fortune, this little cutie is priced just right. J.McLaughlin is killing it in the handbag department right now – you won’t want to miss this wicker satchel (LOVE the bamboo handle), this colorful clutch (perfect for the beach! ), this other circular style, and this bamboo clutch. So much to love!!! A few weeks back I also mentioned my desire to stock my closet with more casual, comfortable dresses for summer. It just gets too hot here in Dallas to wear jeans, and I really don’t like wearing shorts that much. This may be a tall girl problem, but anyone else struggle with finding pairs that you don’t have to tug at all day? 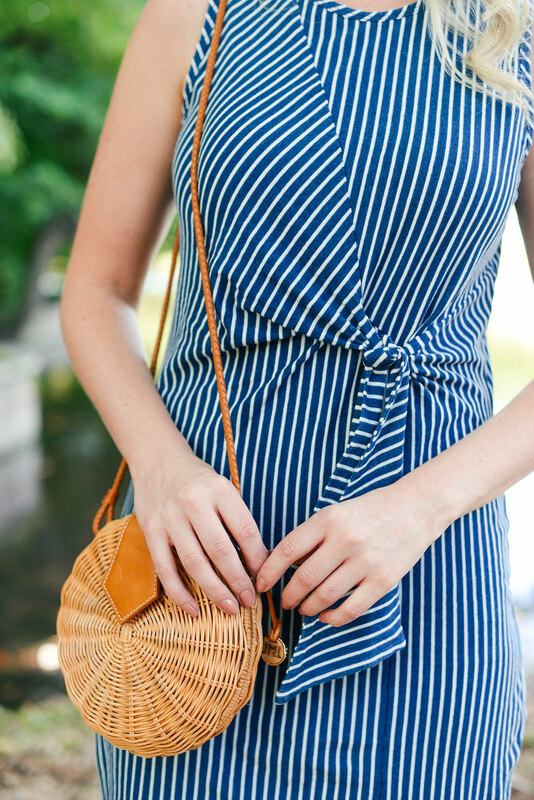 With jeans and shorts out of the equation for me on most days, dresses have become my easy summer go-to. 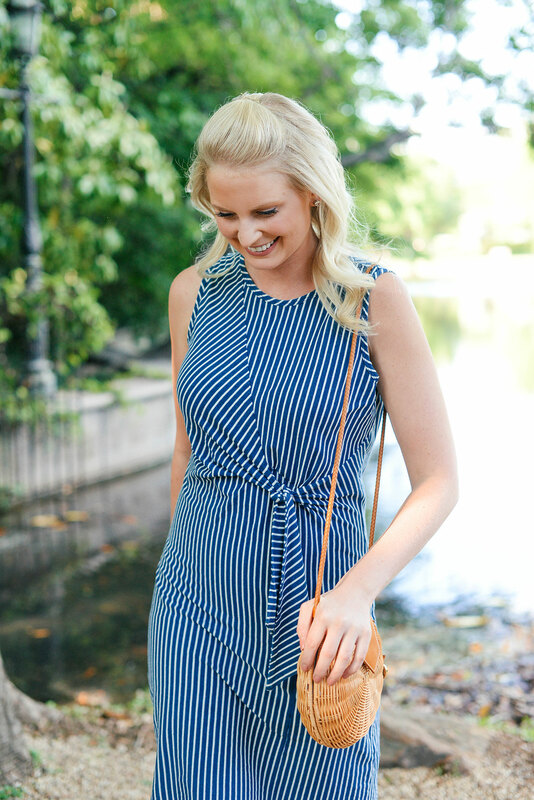 Especially numbers like this lightweight striped dress. It’s such a great throw-on-and-go piece to wear to brunch, running errands, casual dinners, happy hour, you name it! Stripes are always a good idea. Did I mention it comes in a top too? This simple striped boatneck tee is a wardrobe staple every girl needs! Can’t get enough off-the-shoulder pieces? This blue + white dress is so chic and effortless. I haven’t tried on this dress, but from the looks of it you could wear it to nap as easily as you could to dinner. It looks SO comfortable! Another off-the-shoulder top that’ll look fabulous with white jeans for date night. For an ultra nautical vibe, try this sweater. PS – my favorite clutch from last year got restocked!!! Buy it now before it sells out again! 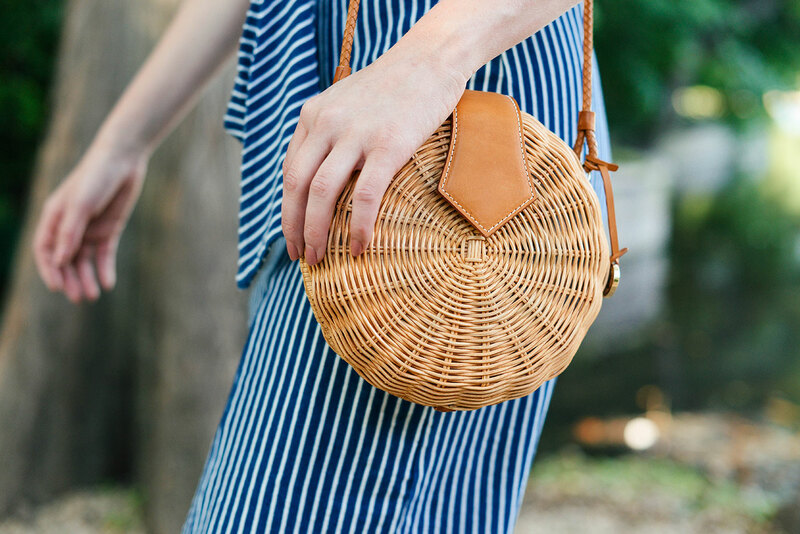 Lately, I’ve been into basket/wicker bags and a small circle one has been on my wishlist! That crossbody bag is so cute! Love that dress! For shorts – try J.Crew’s website – they have some in a variety of lengths. Love how you styled this look, lady! So chic! I love that this purse has a shoulder strap!